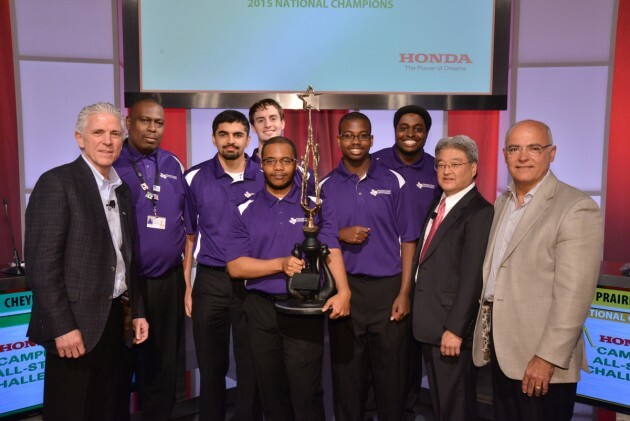 March Madness may be still going on, but March’s other collegiate competition has already wrapped up, with Prairie View A&M University winning the 2015 Honda Campus All-Star Challenge National Championship title. Prairie View’s winning team was comprised of team captain and senior Joseph M. Dowell, senior Brannon A. Billings, sophomore Eric Cole Johnston, and freshman Chayse Lavallais. In addition to the title and trophy, the four students combined to earn their school a $50,000 institutional grant from Honda. This was the second time in the HCASC National Championship Tournament’s 26-year history that Prairie View bested 47 other teams to win the title. The seven other finalists from this year’s “Elite Eight” consisted of Alabama State University, Cheyney University of Pennsylvania , Claflin University, Clark Atlanta University, Norfolk State University, North Carolina Central University and Tennessee State University. Cheyney University-Pennsylvania finished second, earning the school a $25,000 institutional grant, while third and fourth place finishers Alabama State and Norfolk State earned $15,000 each. For pictures, videos, or more info on the 2015 HCASC National Championship Tournament, visit www.hcasc.com.